The Calendar has now been up-dated! Please click on tab above for details of workshops, courses and intensive days of dance in Germany, Austria, Italy and the UK. 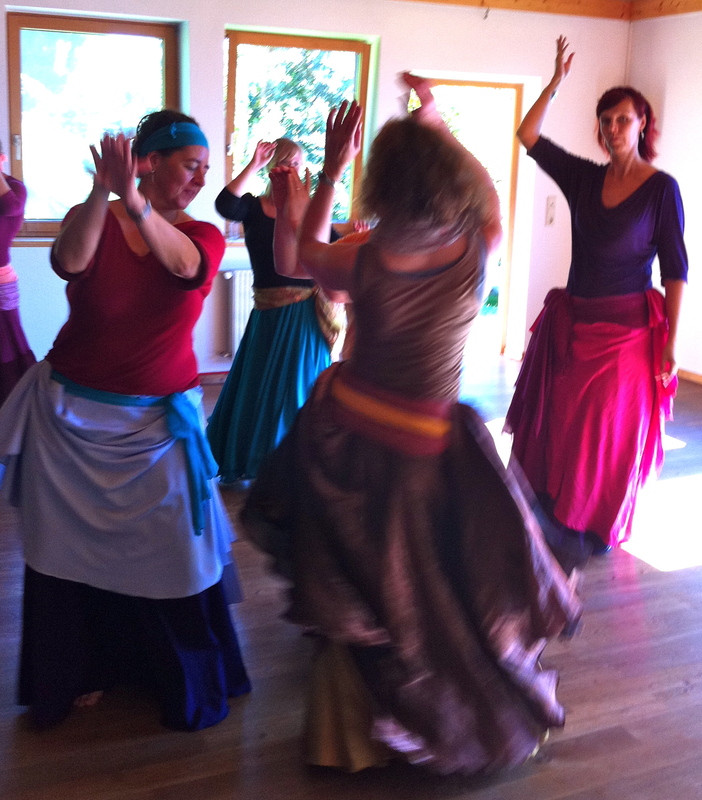 On 16/17 January the 2016 dance year will start with a ‘Moods and Archetypes in Baladi’ weekend in Berlin. This will be followed on the 24th by a Beginners workshop in Stroud, Gloucestershire, and workshops in Munich during the last weekend of the month. Munich and Dursley courses this year will explore the themes of Sha’abi and the Charisma of the Ghawazee (click on Raqs Sharqi tab above). The Sha’abi form of Raqs Sharqi is the dance found around Luxor in the Sa’id (Upper Egypt). Literally it means ‘of the people’ as in ordinary people or country people. Old music from the villages, as well as modern day pop, allows for simple, joyful dancing using repetitive movements. Included in this genre is the dance of the professional dancers, the Ghawazee. Much loved, they brought colour and entertainment to village and family celebrations, and dance to this day to the multilayered Sa’idi music played on instruments unchanged over the centuries. Technique, costumes and a bright smile are not enough to express this dance. Eventually the evocative Sa’idi music, coming down the centuries, calls us to find something deeper, richer. It calls us to find an archaic authentic response and invites us, in the excitement of repetition, to dance effortlessly from our stable centre. Excitement characterises Sha’abi but so does stability, and these two attributes are not necessarily understood by us dancers in the west as we search for that certain something which takes us to the heart of both dancers and audiences alike, and makes the dance so compelling to watch. They would appear to be opposites. In fact the melding of the two is the essence. The year’s course will help us to understand these opposites. It will bring us closer to the culture in which this dance flourished, the dance of the Sa’id which is so pertinent to our lives today. In this workshop, and using both modern and traditional music, we will explore very simply some of the danced archetypes of Egyptian culture and their responding moods. How we dance has almost more impact than what we dance. Although technique is important, it is often not enough as an expression of the music, the culture and who we are as dancers. Music from Egypt and the Arab world with it’s yearning melodies and earthy, often exuberant rhythms, sometimes beautifully simple, sometimes richly complex, is why we dance and how we dance. So there comes a time when we want to come closer, in a deep and creative way, to that what we love about Raqs Sharqi. Raqs Sharqi has infinitely more colour than the smiling, jolly persona that is the usual depiction in the West. There is the possibility of subtle feelings which the music invites us to express, our genuinely joyful celebration but also our sense of beauty, wisdom, drama, sorrow, femininity, courage, contemplation and others. Taking a few of these, this workshop is for everyone to enjoy who has some basic experience or who comes from another style of Arabic dance. *FITNESS *FEMININITY *EXHILARATION *POSTURE . . . AND MORE . Classes on Wednesdays 1.45 – 3.15pm in DURSLEY at The Workshop, Courtyard Clinic, The Old Post Office, Parsonage Rd. GL11 4DR. These are General Level Classes taught on the yogic principle of awareness of our inner harmony. In a relaxed, supportive and pleasurable atmosphere you will learn movements and then use them in improvisational work and in simple choreographies. You will learn about the history of the dance and its cultural context in present day Egypt, as well as about costume and music.